Rockingham Park is a 1-mile (1.6 km) horse racing establishment in Salem, New Hampshire, in the United States. First built in 1906, it was used as an area for many to gamble on the weekends. Seabiscuit raced there in 1935 and 1936, and Mom's Command ran in her first race and gained her first victory there in 1984. Rockingham Park now only hosts standardbred races. Rockingham Park was the first place to receive car gates for starting races in 1998. 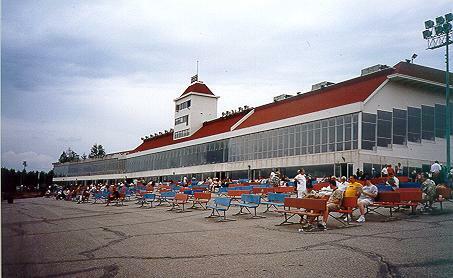 The New Hampshire Sweepstakes (now New Hampshire Lottery) was originated in 1964 and raced here from 1964 to 1967. The race was brought back in 1984 (though not connected with sweepstakes tickets) and has since been the feature event of the summer racing meet. "The Finest Racecourse in the World"
On June 28, 1906, a tiny outpost near the Salem train depot began a 21-day tenure as host to a Thoroughbred meet. Over 10,000 people from as far away as Boston, Rhode Island, and New York flocked to the small New Hampshire town. Their rave reviews proclaimed the site "the finest racecourse in the world". Although Alyth, a two-year-old, won the first thoroughbred race at the site, gambling was still illegal at the time in New Hampshire, and betting was shut down after three days. Underground wagering continued throughout the meet, but the track sat idle for five years after the meet's conclusion; however, these humble beginnings would lead to the formation of a staple of New England culture rich with the history of the sport of kings. In between its stints as a racecourse, the site served as host to a number of historical occurrences. Before the return of racing, Rockingham Park hosted the first aviation meet in New England in 1911, where Lieutenant Milling set a new altitude record of 1,600 feet (490 m) in his biplane. The track also served as the base for the 14th US Army Corps of Engineers during World War I. The racecourse served as a bivouac for soldiers prior to voyages to France. The racetrack was idled again when on July 29, 1980 a fire destroyed the grandstand. The track remained closed until May 26, 1984. The establishment has hosted motorized racing. On July 4, 1925 the track was used for a 100 miles (160 km) race with an average speed of 76.8 miles per hour. Motorcycles races also were held. With the success of the events, a 2 mile board track was built. The track was sanctioned by the AAA, the most recognized sanctioning body of the day. On October 31, a 250 mile automobile race was held on the board track. On August 21, 1926, Curly Fredericks, on an Altoona, set the record for the fastest speed (120.3 miles per hour) that a motorcycle would attain on an oval board track. In 1928, the track held the final motorcycle national championships to be competed on a board track. The 1929 event was held at a dirt track because the inherent dangers in board track racing were discovered, dangers which led to the demise of the sport. The boards on the board track were rotting by 1929 and the board track was torn down. The track was used again as a board track later that year, with 45,000 spectators for a Labor Day event and 52,000 spectators for a Columbus Day event.